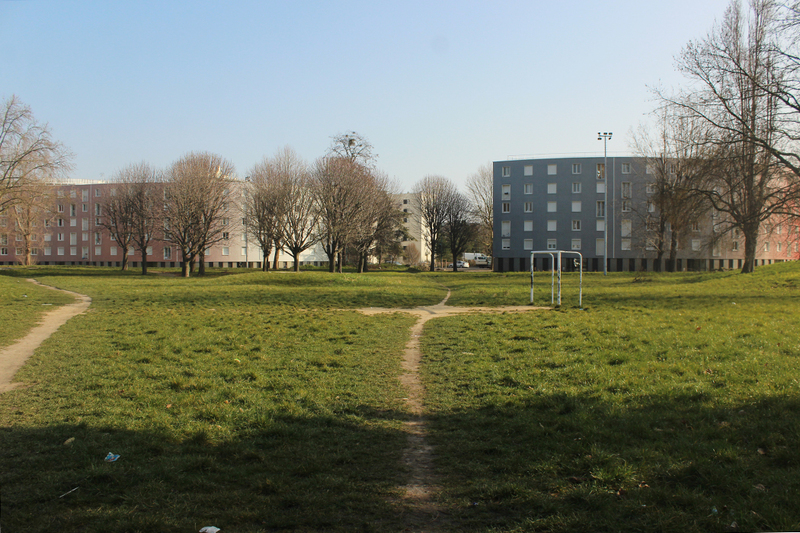 Between 2007 and 2008, and since my return to Paris in late 2014, I have been taking numerous Sunday morning bicycle rides in the Paris banlieues (suburbs). 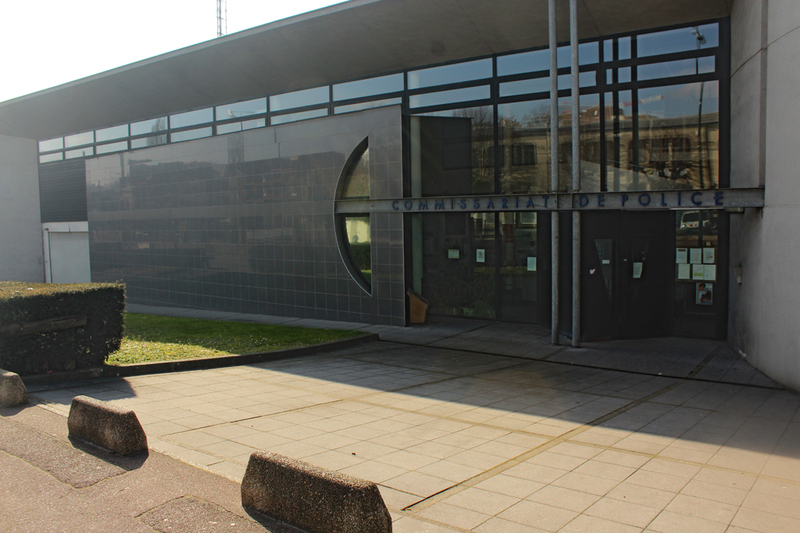 I have always been wary to present these visits here, in any other context than a specific research (such as the one about the weaponized architecture police stations) in the fear that they might end up looking like the orientalist journey of a Paris resident (I live in the 14th arrondissement of Paris) in the ‘wild world of the banlieues.’ This new format to present vignettes from these rides still constitutes a risk of orientalization; yet, many of the buildings visited have a rich (hi)story and it is now my conviction that they deserve to be described instead of remaining in my personal archives as too many have been in the past. My hope is that this collection of vignettes (more will follow) can give an interesting account of the banlieues’ built environment, both in its normalized segregative violence, but also in its construction of an alternative imaginary to the retrograde one traditionally associated to Paris. The map below presents the geographical situation of the six sites visited last Sunday represented by the photographs that follow it. The Parc des Courtillières is what we call a “cité,” i.e. a high density social housing buildings in a low density urbanism, inhabited mostly by low-income residents with the more or less implicit notion that an important part of this population is related to different moments of an immigration from the former French colonial empire (mostly North and West Africa) or, alternatively, from elsewhere (South Asia for instance). 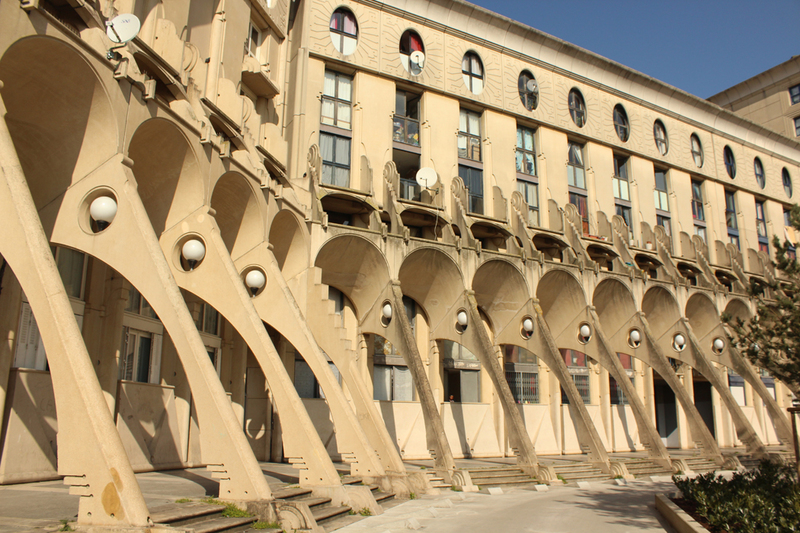 It was built in 1956 as part of the governmental plan to signifanctly increase the amount of available housing in the Paris region following the historical 1954 radiophonic discourse by the well-known Abbé Pierre, founder of Emmaus, the main French organization struggling against homelessness since 1949. 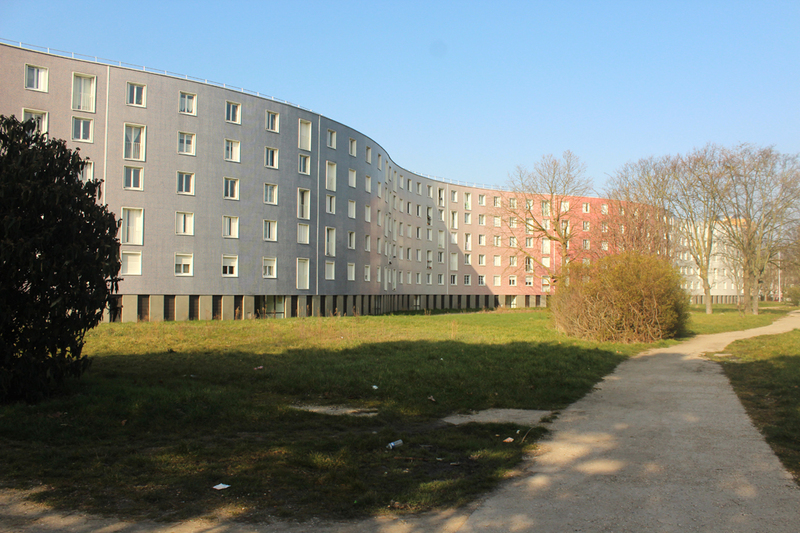 The social housing complex was designed by Émile Aillaud, who was also the architect of a similar, yet larger and more removed, neighborhood ten years later: La Grande Borne in Grigny. 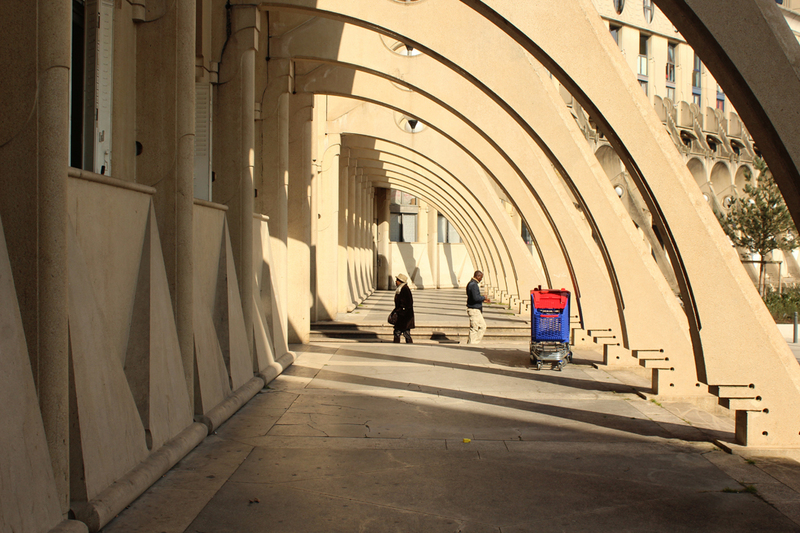 As the photographs above attest, the state of the common space formed by the serpentine buildings reflects the poor conditions in which the cités are often left, and we may even wonder what militarized purpose the concrete blocks set up at its entrance are supposed to serve. A renovation program is however in progress and, although we should welcome this salutary operation, we should remain cautious critical as it is typically during these transformations that the police imposes it spatial agenda in neighborhoods that it antagonizes more than protect (see past article). 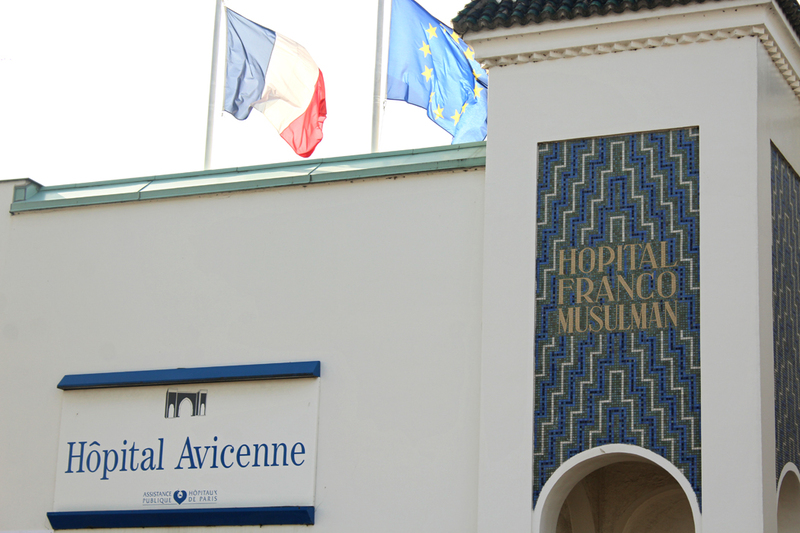 The Avicenne Hospital is currently a regular hospital in Bobigny but as its name (Avicenna was a 11th century Persian doctor and philosopher) and its orientalist portal (the architect, Maurice Mantout, is also the architect of Paris’ Great Mosque) may indicate, its history is rather unique. 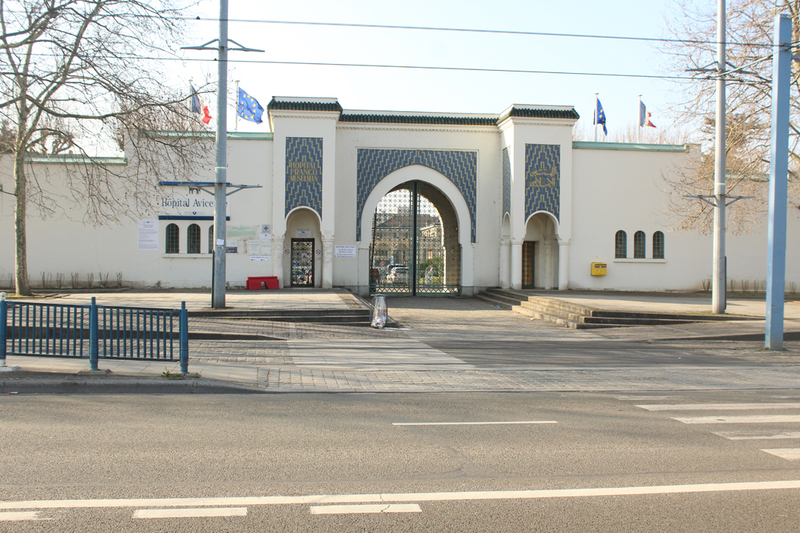 It opened in 1935 under the name “Hôpital franco-musulman de Paris” (French-Muslim Hospital of Paris) to achieve a double goal: segregate Arab patients from the White ones following a racist societal pressure and the dubious policies of then President of Paris’ Municipal Council, André-Pierre Godin — they both find clear echoes nowadays — as well as facilitate immigration control by leaving the hospital administration to the Paris police prefecture and the “North African Indigenous Protection and Surveillance Service.” This official collusion of (paternalist) protection and surveillance could not be more expressed than in the very function of this hospital: the care (including the presence of translators if need be) is described to be of good quality, but the distance from the center of Paris, as well as the fear of being administratively monitored refrained a certain amount of immigrants to require its services, leaving them without health protection. 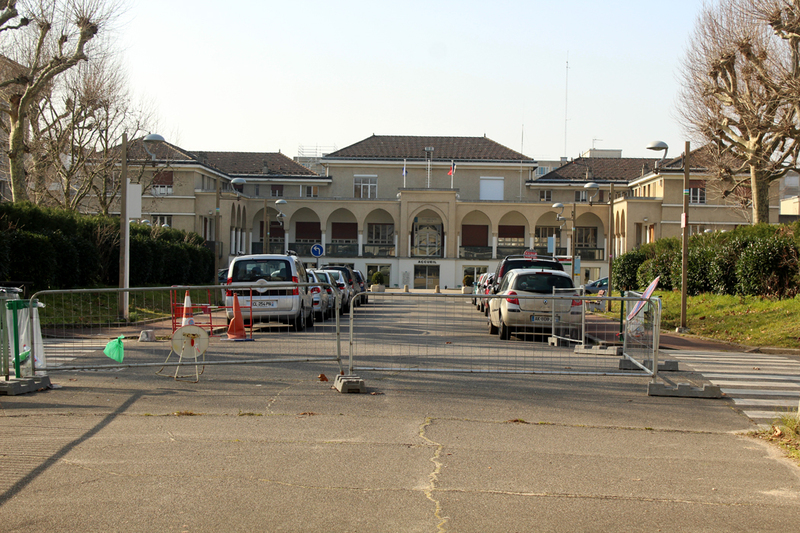 After World War II, the hospital started to gradually accept patients from surrounding municipalities, and thus to regularize its function. 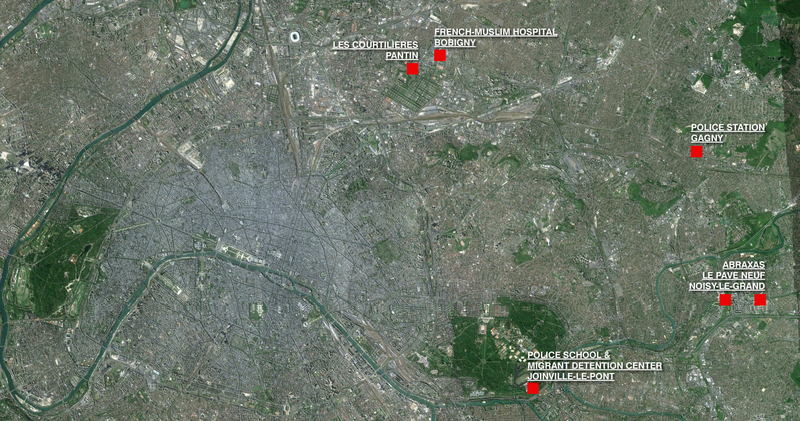 To read more about the hospital, I highly recommend Clifford Rosenberg‘s book Policing Paris: The Origins of Modern Immigration Control Between the Wars (Cornell University Press, 2006) that dedicate an entire chapter to it. 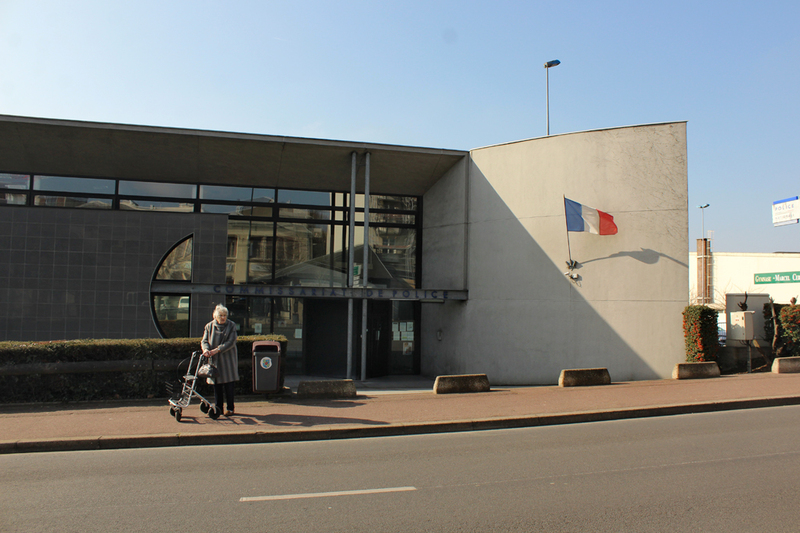 Gagny’s police station is the ninth and likely penultimate object of my photographic series dedicated to Paris’ Northern and Eastern banlieue police stations’ weaponized architecture (see here). 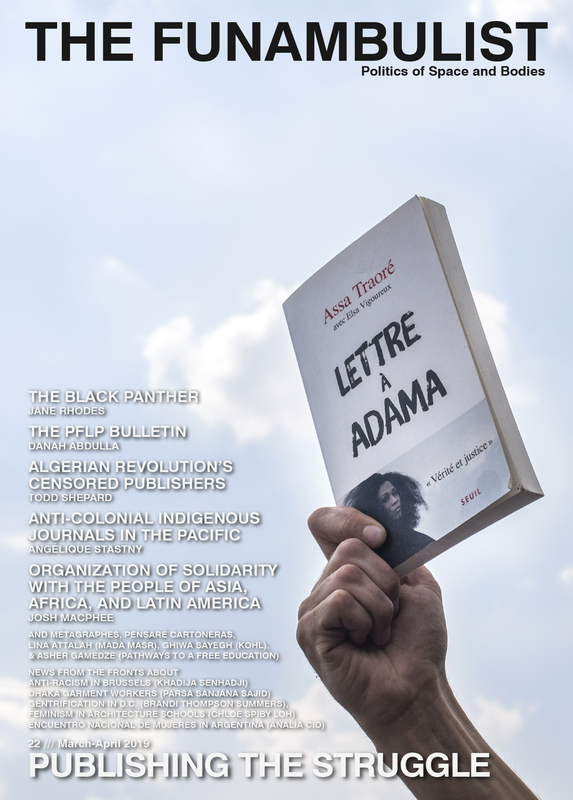 Here again, the relatively new and cautious design of the police station fails to hide his fortified characteristics that reveal the police’s antagonism for the local youth and its manufactured myth of a potential civil war. To read a longer text about this series, see part 1. 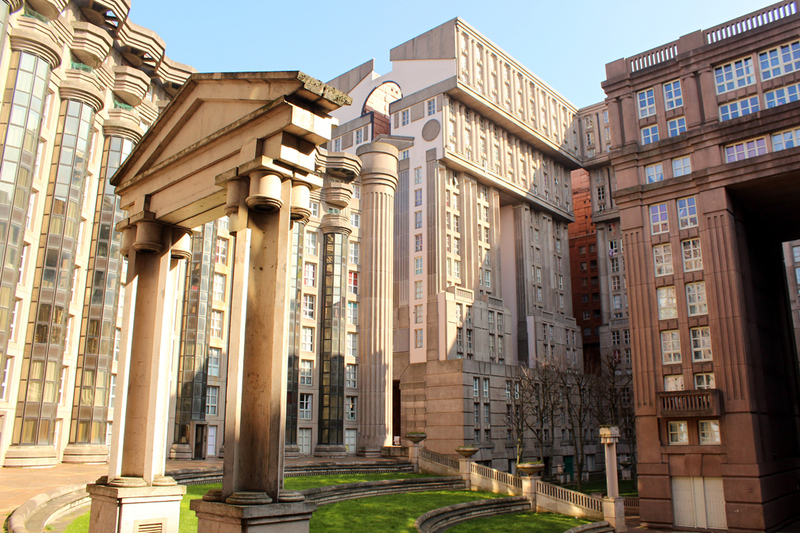 Opened respectively in 1983 and 1985, the Espaces d’Abraxas and the Arènes de Picasso in Noisy-le-Grand were designed respectively by Spanish architects Ricardo Boffil and Manuel Núñez Yanowsky. 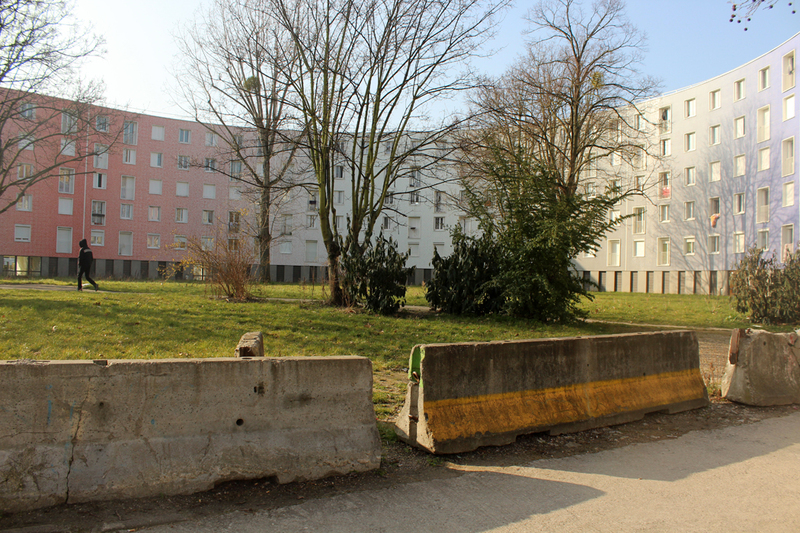 While the former is simply a residential complex, the latter is a social housing complex part of the cité du Pavé Neuf (8,000 inhabitants). 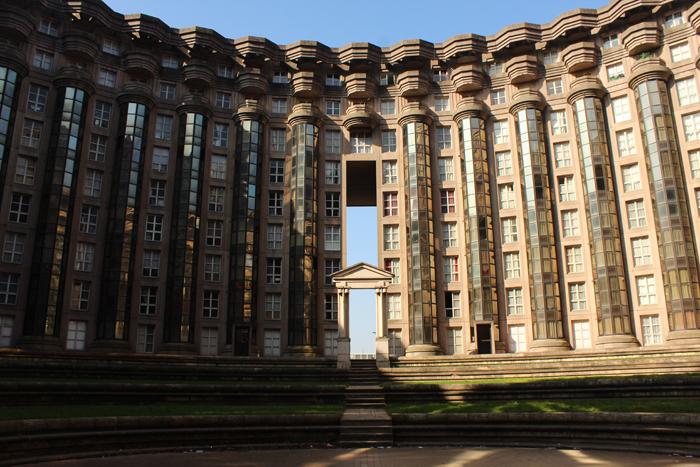 Abraxas is a massive post-modern building (see architectural drawings here) hosting 1,000 apartments whose confusion of eras and grandiose characteristics made it the setting of several science-fiction films such as Terry Gilliam’s Brazil (1985, see below) and Hunger Games (2014). 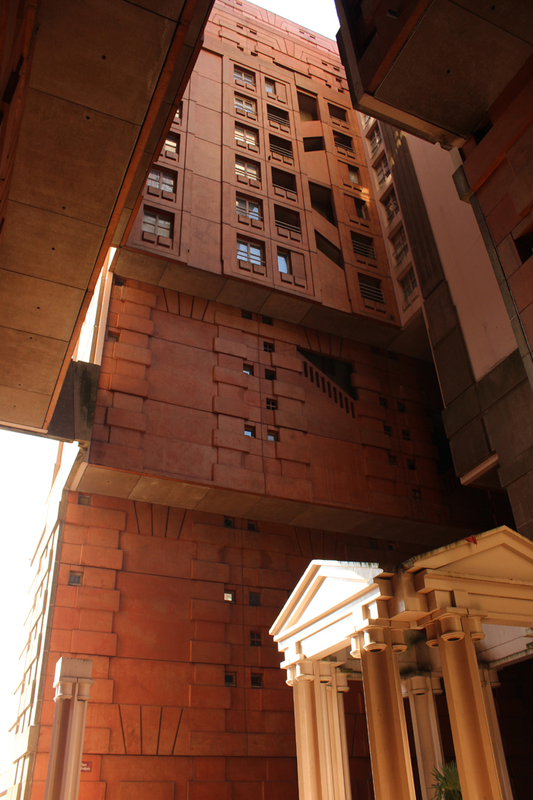 The Arènes de Picasso, as its name suggests, are mostly organized around a central square on which two monumental cylindrical buildings face each other. 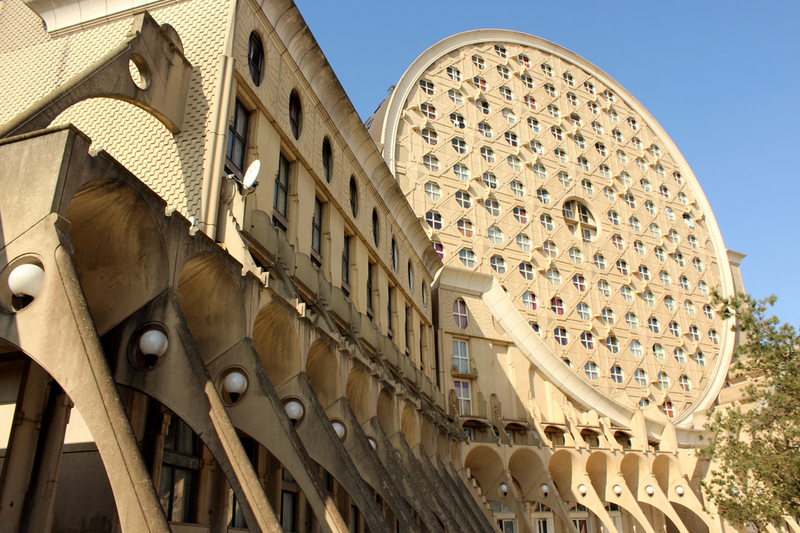 The cité was recently renovated with what is accounted as a minimum of demolition. The Redoute de Gravelle is a 19th century fort built as part of a fortification complex to defend Paris. Nowadays, it combines numerous functions in a particularly problematic programmatic confusion. 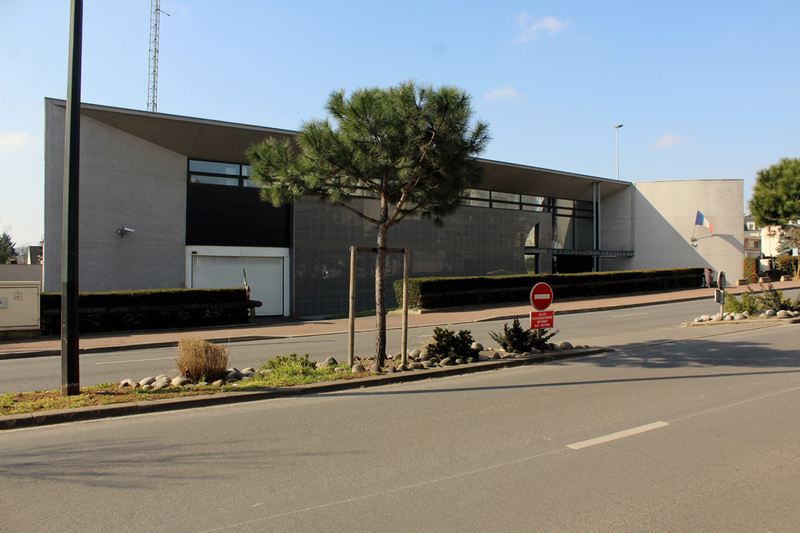 On the one hand, it hosts the National Police School, as well as the “Cynophile Unit” (the police unit using dogs for, here again, a confusion of functions from national security to the “fight against urban violences”…) and, as the photograph above attest, the storage of apparatuses of crowd control. However, the barbed wire fences, surveillance cabin and surveillance apparatuses visible on this same photograph are not meant to protect the training police officers nor the dogs (! ), but it actually encloses an “Administrative Withholding Center,” i.e. 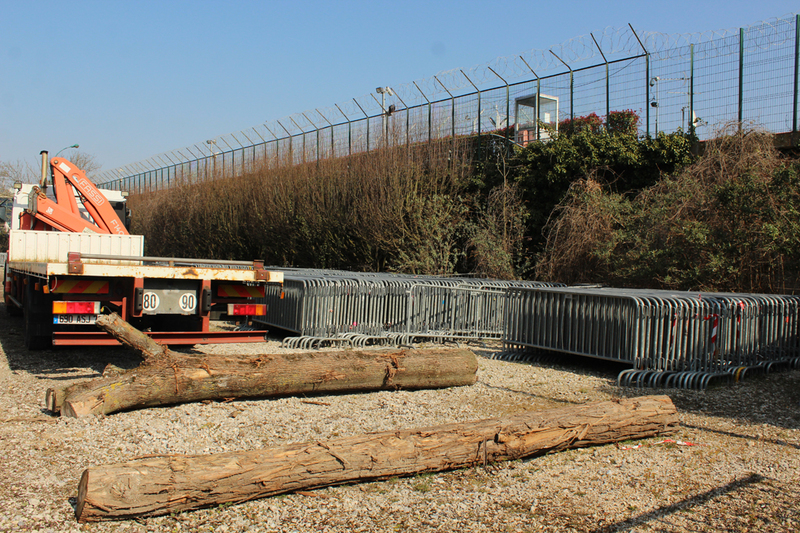 a migrant detention center imprisoning people controlled in an irregular visa situation. 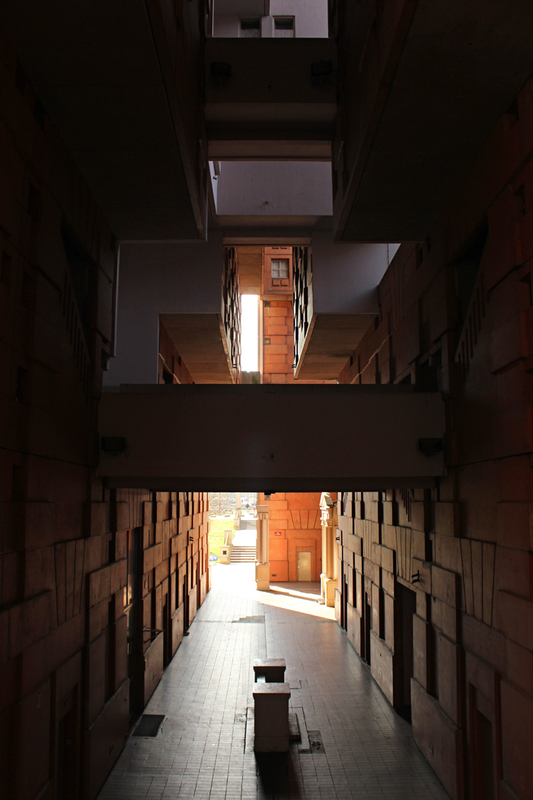 We can see here how buildings designed with embraced military characteristics can be turned without trouble into carceral environments preventing any unauthorized access or exit from them. A few hundred meters further, the Vincennes racetrack regularly hosts its famous events such as the Prix d’Amérique in complete indifference for the violence continuously deployed in its periphery.